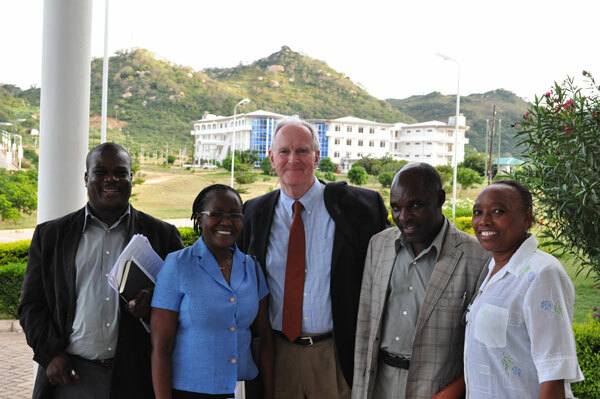 In an April visit to the Tanzanian cities of Dodoma and Dar es Salaam, GWI Interim Director Marty Kress and Senior Research Associate Rebecca Gianotti advanced the development of the WE3 Program and related educational initiatives in meetings with both established partners and new collaborators in the government, academic, non-profit and multilateral sectors. Renewal of a three-year Letter of Intent for collaborative research, teaching, and outreach activities between Ohio State and the University of Dodoma, signed by senior leaders at both universities. Notification that the Tanzanian Ministry of Health has approved the granting of certificates for Tanzanian nurses who complete Ohio State-led neonatal training that will be offered this fall by the Grief Neonatal Survival Program. Image caption: Senior leadership at the University of Dodoma poses with GWI interim director Marty Kress after signing a renewed Letter of Intent for collaboration with Ohio State. Pictured from left to right, Adam Mwakalobo, Rehema Kilonzo, Marty Kress, Albino Tenge and Flora Fabian.